The Ultimate display solution for harsh environments. There has never been a LCD screen like the Xtreme™ displays. Eliminating the need for vents, filters or exhaust fans, the unique fully-sealed design provides the ultimate protection against weather, water, dust, fumes, heat and cold. A patented Dynamic Thermal Transfer™ system keeps internal components safely warmed in extreme cold and properly cooled in extreme heat. 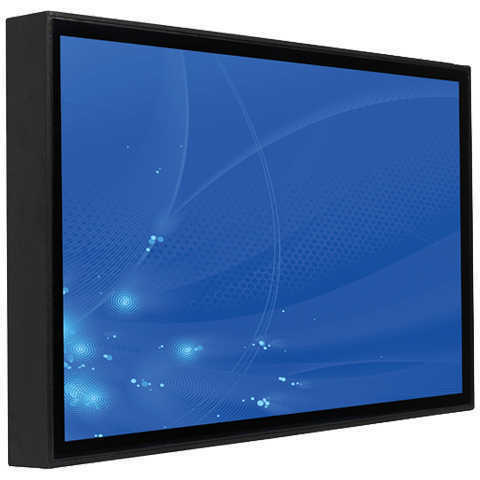 These outdoor flat panel displays have the highest ratings for water and dust-proofing in their class, making them the perfect choice for any location, indoor or out, where standard screens would fail. Fully-sealed technology provides the highest levels of environmental protection possible, for a display solution that can be fully immersed in water, goes beyond dust-proof and has the widest operating temperature range of any LCD screen. Xtreme displays are packed with features and benefits to ensure that they deliver effective content in a range of applications and in any environment indoor or out. A unique manufacturing approach makes it the first outdoor display without vents, filters or exhaust fans. Xtreme’s™ patented overlap design eliminates seams and makes rounded corners possible, providing a fully-sealed, seamless display so smooth that water and dust just roll off. Without seams, it is the only outdoor display that is impervious to dirt, dust, water, ice or insects. The 2,500 nit brightness Full 1080p HD screen provides the best picture quality with outstanding colour depth, resolution and fast refresh rates, creating an outstanding viewing experience whatever the weather. Automatically adjusts the high-contrast panel to best match the lighting conditions making the content easy to see in bright and varying sunlight. Protects the screen from impacts and the elements. But no screen is indestructible and should the screen be broken, it won’t shatter, protecting nearby viewers and property. Xtreme™’s patented Ventless Dynamic Thermal Transfer™ system keeps internal components safely warmed in extreme cold and properly cooled in extreme heat, all without vents, filters or exhaust fans. This provides the widest operating temperature range in professional outdoor displays, offering new and exciting opportunities for display placement. There are very few places on Earth that these screens will not operate. Xtreme™’s unique triple protected body construction shields internal components against water, smoke, dust, chemical clouds, fuel exhaust, microparticles, acid base or ice. Triple protection begins with a precision aluminium body construction, providing exceptional anti-rust and anti-corrosive features. Second, a chemical sealer is applied to the aluminium during the wash process adding a better bonding agent for the paint. Third, an all-weather powder coating is electrostatically applied and baked on. When combined, the triple protected display body construction provides UV stability, added endurance and maximum resistance to harsh environments – all without sacrificing style. Connection to the screen are made via a sealed hatch. The water-proof seal ensures that the signal connections are unaffected by weather conditions and provides maximum protection to internal components by preventing water, dust, ice or air from entering the flat panel display. All connections are fully compatible with standard cables and do not require special connectors. The Xtreme™ flat panel display includes all standard A/V inputs, providing a connection to any content driver, delivering everything from computer media to Blu-Ray players. Only Xtreme™ fully-sealed displays have earned an IP 68 rating. The IP (Ingress Protection as defined by DIN EN 60529) rating indicates the external conditions LCD displays can withstand and describes the scope of protection during use when exposed to temperatures, fuel and oil and their fumes, chemical clouds, acid based moisture and dust entering the display. The first number lists the ability to protect against dust. A 6 rating means the unit is completely protected against dust. The second number lists the level of protection against moisture. An 8 rating states that the display can be immersed in water and still operate. Only Xtreme™ fully-sealed displays have earned the NEMA 6 rating. The National Electrical Manufacturers Association (NEMA) established a range of standards for enclosed electrical equipment. Each rating corresponds to a protection level against designated environmental conditions such as dust and water. A NEMA 6 rating is defined as protection against dirt; against hose-directed water and the entry of water during occasional temporary submersion at a limited depth; and won’t be damaged by the external formation of ice on the enclosure. Operating range is the acceptable temperature range that a screen will work without exposing the LCD to damage. The Xtreme outdoor display provides the widest operating range of any outdoor display. 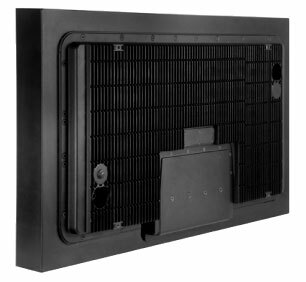 Xtreme’s unique Ventless Dynamic Thermal Transfer™ system keeps the display operating perfectly in any weather without the need for exhaust vents or bulky HVAC systems. Xtreme Screen being hosed down. Contact us on 01462 433558 for your tailored screen solution quote. Go beyond expectations for outdoor displays with Xtreme™’s fully-sealed, seamless professional flat panel displays. Without vents, filters, or exhaust fans nothing gets in and nothing gets out. Fully-sealed technology provides the highest levels of environmental protection possible and a streamlined design ideal for use in commercial applications both outdoors and indoors. All of which open up exciting new possibilities for screen applications regardless of the screen placement or environment. Some companies market their products as ‘waterproof’ when they really mean ‘water resistant’. Displays with ratings lower than IP 68 can still have vents, filters, exhaust fans and exposed seams, all of which provide an opportunity to let water find its way into the display over time. Only Xtreme™’s professional outdoor displays feature fully-sealed, seamless technology earning the coveted IP 68 rating, the highest rating in the industry. Able to withstand pressurized washing from any angle, it is the only outdoor display that can be submerged in up to 5 feet of water for 8 hours and continue to operate reliably. Making it the first truly waterproof flat panel display. A totally seamless design with rounded corners provides no opportunity for water to collect, freeze and compromise the panel’s body. Ice simply cannot get a foothold on an Xtreme™ display. The Xtreme™ professional flat panel displays provide the most robust protection against ice damage. At NEMA 6, Xtreme’s™ professional outdoor flat panel displays provide the ultimate in protection against dust, microscopic particles and dirt. A perfectly smooth seamless design prevents particles from collecting in seams, working into the display and damaging internal components. Xtreme™’s professional flat panels were designed to ensure perfect operation even in the most demanding environments. Exhaust vents and seams provide an opportunity for insects to get inside an outdoor display. Only the Xtreme™ outdoor display provides a completely ventless and seamless solution that is fully-sealed and provides no openings for any threats from insects that can damage the internal components or circuitry. This makes the Xtreme™ fully-sealed, seamless professional flat panel displays the ultimate outdoor panels for use in public areas where insects and bugs are prominent. Only the Xtreme™ outdoor displays patented Ventless Dynamic Thermal Transfer™ system combines internal air circulation with a patented thermal transfer heat sink maintaining the display’s internal operating temperature. This technology provides displays with the industry’s broadest operating range of -40°C to +60°C (-40°F to +140°F), making the Xtreme™ displays truly weatherproof. Able to withstand casual impact and resist smoke, debris, micro-particles, acid base, chemical and fuel clouds, and dust, an Xtreme™ professional display is tough enough to operate in harsh industrial settings as well as virtually anywhere outdoors. Xtreme™’s exclusive fully-sealed technology protects high quality display components in a sleek form factor, housed in a triple-protected aluminium body with rounded corners. Get the highest levels of protection in a sleek display. Using digital signage outdoors or in hostile environments usually requires a specialist enclosure to protect your electronics. Although a dedicated enclosure can provide additional corporate styling, or just space to store additional equipment such as PC’s for driving the screen, if you just need a quick and simple screen then the Xtreme range is perfect. Innovative technology pushes the possibilities of Digital Signage placement. Xtreme™ displays offer the widest operating range of any outdoor display and a patented fully-sealed design that completely envelopes the TV. The industry leader for outdoor solutions ranging from a single panel installation to complete multi-display video walls in any environment or in harsh indoor environments where moisture, humidity, chemicals, fumes, ice, dust or even insects might degrade a less robust display. There is nothing like the salt air of the sea – for destroying TVs. Corrosion, humidity, moisture – even other ‘waterproof TVs’ are subject to these elements because they still rely on vents, filters and fans. Xtreme™ displays are the only truly waterproof displays, with a patented fully-sealed design that keeps working even if fully submerged. Whether it’s entertainment on a cruise ship, personal yacht, motorboat, or wayfinding on the dock these display solutions go beyond expectations. When it’s game time, you need a display that’s tough enough to take what the weather, mother nature and the fans can dish out. 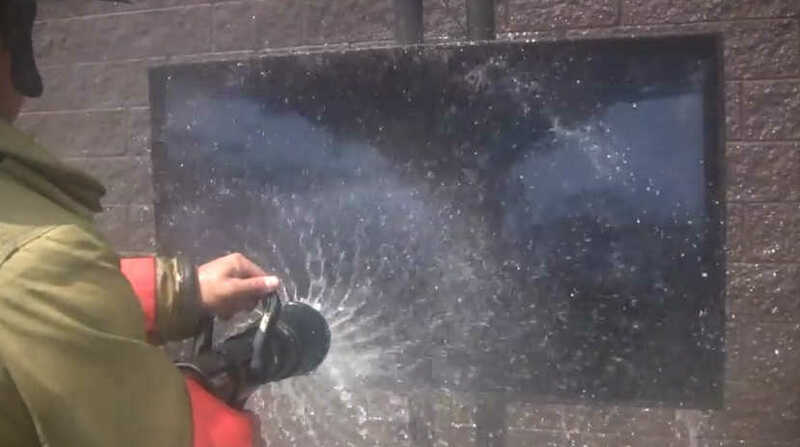 Xtreme™ display’s patented fully sealed design operates in the widest temperature range (-35°C to +60°C) and has no vents, filters or fans, which mean they can take the punishment thrown at them and be washed off with pressure hoses without damaging the internal components. The slim bezel means they can even be used to create multi-screen video wall configurations for the ultimate outdoor display. Bus depots, train stations, subways – they all have silent killers of ‘outdoor’ flat panel displays – exhaust fumes, chemicals, microparticles and brake dust. Most ‘outdoor’ displays still rely on vents, filters and fans – meaning you must regularly change the filter as fumes, dirt or brake dust clog the exchange of air in and out of the display. With the widest operating range available (-35°C – +60°C) and the highest IP68 and NEMA 6 ratings, Xtreme displays keep working in the harshest environments. From interactive kiosks and advertising points to digital signage and interactive wayfinding, these all-weather solutions change how you interact with your customers by providing an elegant yet robust solution that works in virtually any environment. Ambient Light Sensors automatically adjust the high-contrast panel to best match the lighting conditions ensuring the content is easy to read in bright and varying sunlight. Bathrooms, Changing Rooms, Wet Rooms etc. Screens are commonplace in Gym’s and Spa’s but most are limited to the dry areas. Use Xtreme screens to extend that coverage to all areas of your establishment – indoor and out. Install these screens next to swimming pools, jacuzzi’s or other wet areas without issue. They are also ideally suited to luxury bathrooms – what could be better than a nice soak in the bath while watching your favourite TV. Entertain and inform customers while they wait with the Xtreme Outdoor Display. Sending an eye-catching message can reduce perceived wait time, turning a potentially negative experience into a positive sales opportunity. Also ideal for banks, pharmacies, cinemas, amusement parks, the Xtreme displays come in a variety of configurations to meet your needs. The screens feature an IP68 rating which means its built to withstand the harshest environments and can even be pressure washed. Install digital signage in and around your car wash without worrying if it gets wet or dirty. Use this opportunity to promote value-added service packages at a lower cost than traditional advertising; on-site digital signage can grab a customers’ attention and help increase impulse purchasing. Or let your customers watch TV while having their car washed – make your business standout from the others. Create and display Personal Protective Equipment updates easily with Xtreme screens. The units can also be used to direct truck traffic. An IP68 rating means the units are fully protected against dust, water and whatever elements the site may throw at them, and can be easily cleaned at the end of the day. Building sites are notoriously dirty places. Adding digital signage to inform staff and visitors about important safety information, or local passers-by about developments and schedules helps build your brand recognition. Digital signage is used in many factories these days to keep track of manufacturing schedules and production times, but if your factory or workshop is making parts that produce air-born particles, fumes, mist or smoke etc. then standard screens will eventually clog, corrode and fail. By using an Xtreme screen you can guarantee a longer life-span for your signage. Whether it is to display production schedules, safety notices or company bulletins you can now put screens in locations that where previously out of the question. Using screens in semi-outdoor environments can cause many issues. The build-up of dust and moisture over time means that even if a standard screen is located in an outbuilding it will still be affected by weather conditions. By using a Xtreme screen you have no worries about temperature, humidity, dust or insects. If the screen does get dirty then you can simply hose it down and keep working. Adding score-boards, countdown timers and other statistics to your sporting arena helps make your business standout from the competition.